Welcome to the Official Gumby Store! 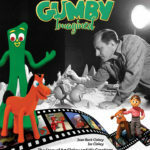 Gumby Imagined, The Story of Art Clokey and His Creations, the ultimate Gumby retrospective is now available. Written by the Joan and Joe Clokey, this 300-page art book is packed incredible photos and never-before-told stories of Art’s life and the characters he created. Gumby DVDs! 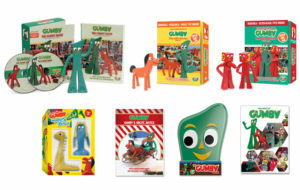 Get your favorite classic, remastered Gumby episodes in these gift sets, which include bendable toys and fun extras. Check out the newest additions to the collection: The New Adventures of Gumby – The 80s Vol. 1 which includes Prickle and Goo bendable toys, and The Best of Gumby, featuring Gumby fans’ favorite episodes. If you've got a heart, then Gumby's a part of you. He was once a little green slab of clay, but you should see what he can do today! This collection of entertaining Gumby episodes includes fan favorites from the 50's, 60's and 80's. The New Adventures of Gumby, the 1980s Series, Volume 1, collector's edition includes 250 minutes of fun re-mastered Gumby adventures. An added bonus: Prickle and Goo bendable toys are in the box!